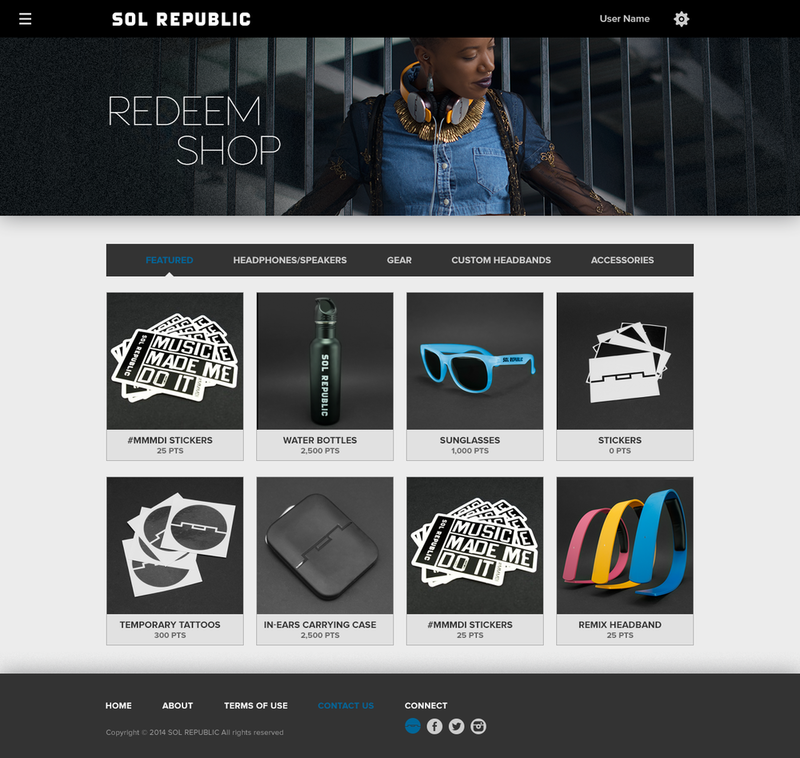 Challenge: Create a way to engage, enable and growing base of SOL REPUBLIC superfans . The goal of SOLdier of Sound is to be able connect with our fans and empower them to help us get the word out about SOL REPUBLIC. In it's infancy SOldier of Sound started out as a small select group of super fans. Over time that group was extended to a Facebook private group. However the group started to become unwieldy with fans having different interests and limitations on segmentation and 1:1 communication. Phase 1: We outlined the features we would like the platform to have. At its core it would need to be able to allow us to communicate and engage fans and at the same time enable the fans to complete missions for points that can be redeemed for gear and other exclusive items. Phase 2: We looked at several third party loyalty rewards platforms to see if any could meet the current needs. Some offered community aspects while others offered the rewards features but none seemed to encompass the whole package. Phase 3: The team realized that no one third party solution would be able to address all functional needs, and that proprietary platform would have to be built from scratch. We hired a external team to help build and manage the front-end and back-end. 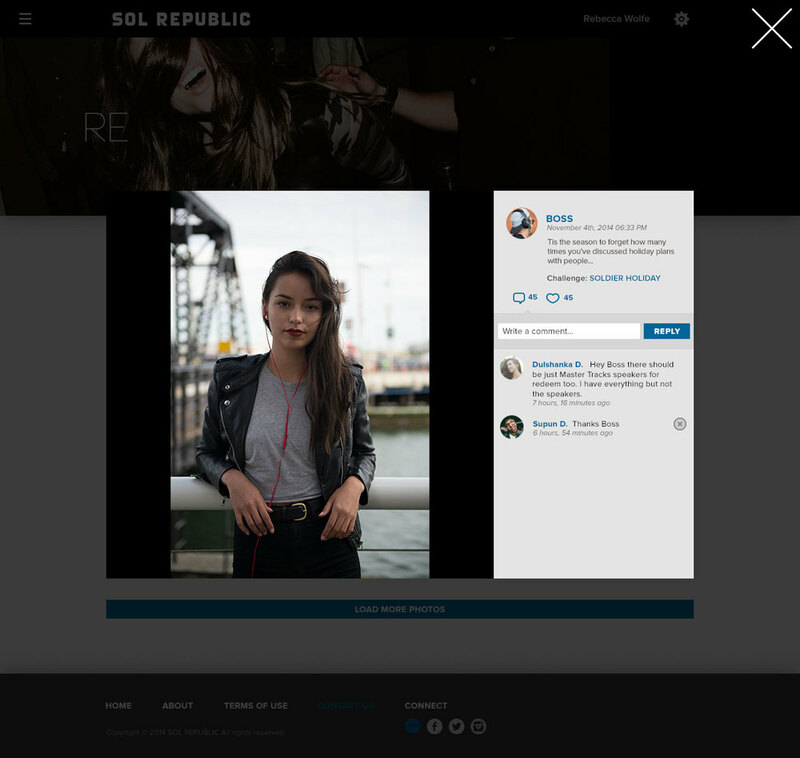 Activity Feed: Similar to Facebook, users can post content and share what music they are listening to or where they might have seen SOL REPUBLIC out in the wild. More importantly we can message to the whole group or select group about promotions, events, or launches. Challenges: Users are given challenges that range from simple tasks of following us on social, to more difficult and time intensive tasks that include helping out at events or creating video. Depending on the challenge a different set of points are rewarded. Levels: Adding gamification elements increases the engagement of the platform, to keep with the military theme there are different levels as seen below. User get really excited about leveling up and share this with their friends. Rewards: Users are able to redeem their points for gear and other accessories. University: A secondary element is introducing the brand on college campus. We had a handful of colleges selected with "Campus Generals" who set up events and activations on campus. The university section allows campus generals to interact with students on their campus. Referral: The key to the platform is growing it. We reward users a certain amount of points for every new user they activate. In certain instances we also have promotions to encourage higher volume sign-ups for larger prizes.